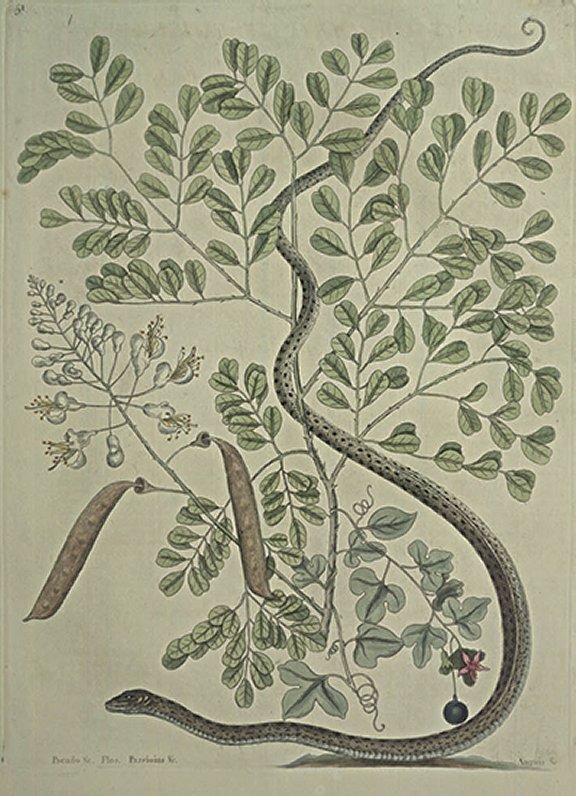 This is a slender Snake, usually about the Size of the Figure, the Upper Part of it was Brown, spotted with Black, the Belly White, on the Ridge of the Back extends a Lift of White, the whole Length of it. They are Harmless, and without any Characteristick of a Viper. The Value of this Wood has occasioned a Scarcity of it on the Bahama Islands, particularly the largest Trees being cut down; so that to what Dimensions they grow, where largest, I know not; the Biggest of those remaining, not exceeding two or three Inches in Thickness, and eight or nine Feet in Height, the Branches are slender and full of small Prickles, the Leaves are pinnated, the Lobes growing opposite to each other, broad at their Ends, with one Notch. The Flowers are white, papillionaceous, with many Stamina and yellow Apices, growing in a pyramidal Spike, at the End of a long slender Stalk: The Pods inclose several small round Seeds. The Inhabitants of the Bahama Islands formerly got great Part of their Substance by cutting this Wood, but it is now much exhausted. It is used in Dying, there being yearly great Quantities of it sent from these Islands, and other Parts of the West-Indies to England for that Use. The Leaves of this Passion Flower, resemble that of the Hepatica, consisting of three Lobes, or rather a Leaf divided by three Segments. The Flower is of a Peach Colour, formed like others of the Kind, except that the Cup is longer than ordinary. The Fruit is small, round, and of a deep blue Colour.